"Westport and Westport Slough, Oregon"
Click image to enlarge Westport Slough, Oregon. Image taken September 17, 2012. The small Oregon community of Westport is located on Plympton Creek where the creek meets Westport Slough, approximately one mile upstream from the Slough's merging with the Columbia River at River Mile (RM) 43. 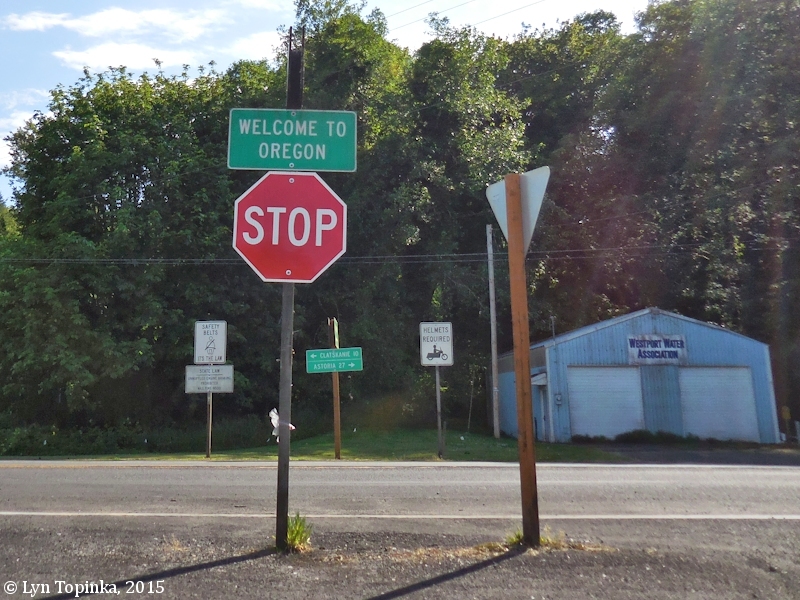 Downstream is the community of Wauna and upstream is Jones Beach, the community of Clatskanie, the Clatskanie River, and the small community of Mayger. 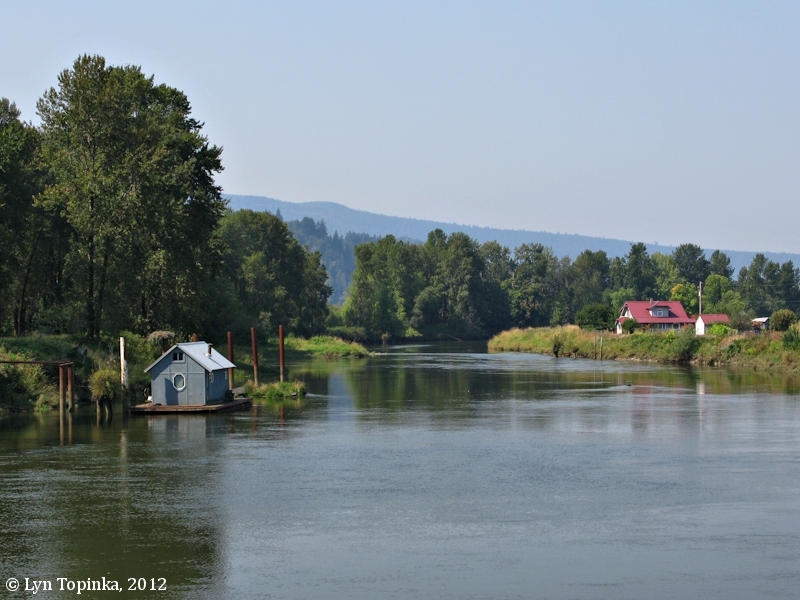 The Westport Slough is an historic side channel of the Columbia River which begins near the community of Westport and meanders more than ten miles eastward through the flood plain of the Clatskanie River. Once a major migrating salmon route, the Westport Slough was plugged by a levee in 1936 and later topped with a county road as part of improvements authorized by the Flood Control Act of 1936. The Act was to provide flood protection to agricultural lands. Currently an effort (as of 2005) is underway to restore the connection between Beaver Slough and Westport Slough to provide free-flowing water between the systems which would open up miles of improved spawning and rearing habitat in the Lower Columbia for Coho and Chinook Salmon. The Westport Slough merges with the Columbia River at River Mile (RM) 43, at Westport, Oregon, just across from the upstream end of Puget Island. 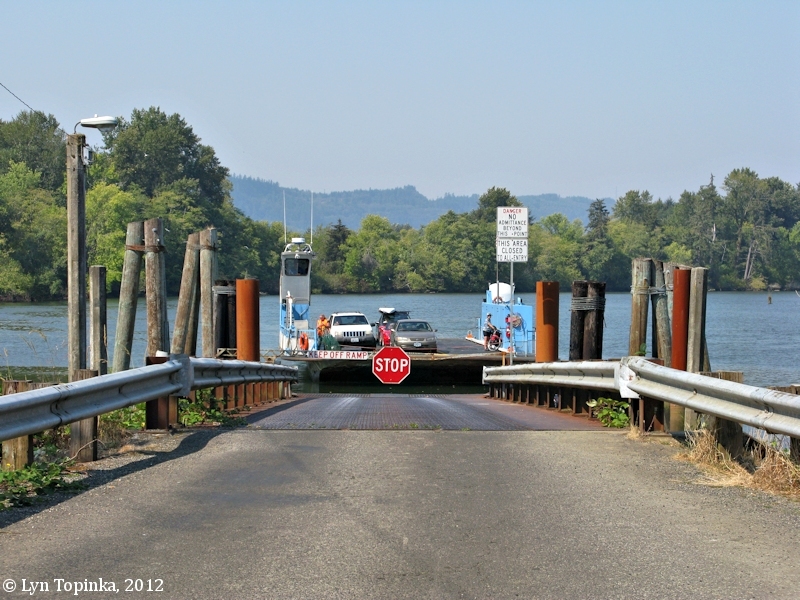 In 1925 a ferry service began, running between the Westport Slough and Puget Island. Westport was named after John West, who settled in the area about 1850. "Captain West" ran a sawmill and established the first cannery in Clatsop County. The U.S. Bureau of Land Management's General Land Office Records (GLO) website (2011) shows John West and Margaret West being granted title to 527.63 acres of T8N R5W Section 31 and T8N R6W Section 36 on July 21, 1873 (1850 Oregon-Donation Act). The Westport Post Office was established in December 1863. Scottish-born John West settled on the lower Columbia River in the early 1850s where he built and ran a sawmill. About 1857 West began salting salmon in barrels and in 1869 he built the first cannery on the Oregon side of the Columbia River. In 1881 West moved his cannery to Hungry Harbor, Washington. "WESTPORT, 74.5 m. (32 alt., 450 pop. ), is one of the many lumbering and fishing towns scattered along the waters of the Columbia." Click image to enlarge Oregon Highway 30 heading west, through Westport, Oregon. Image taken September 22, 2012. 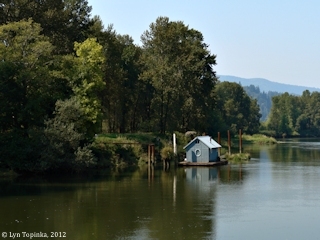 Click image to enlarge Scenic, Westport, Oregon. Image taken September 17, 2012. 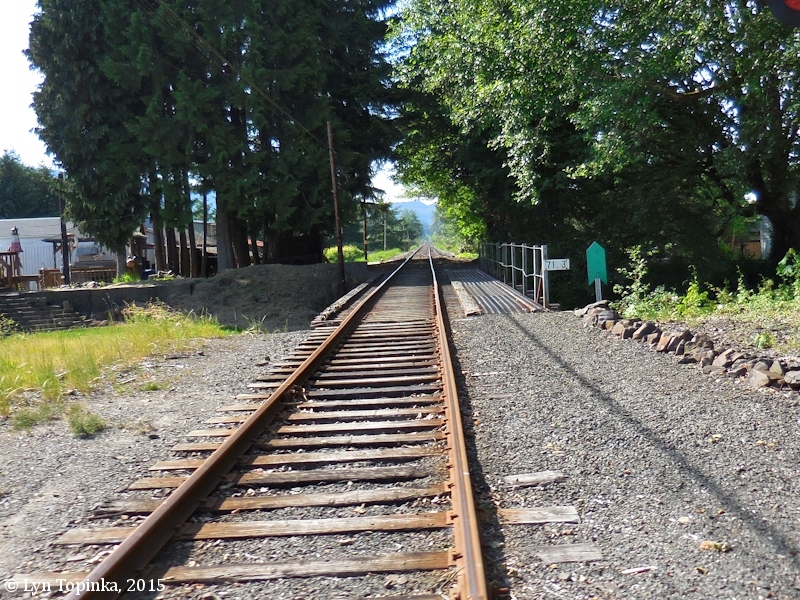 Click image to enlarge Tracks crossing Plympton Creek, Westport, Oregon. View from moving car looking northwest. Image taken May 20, 2015. 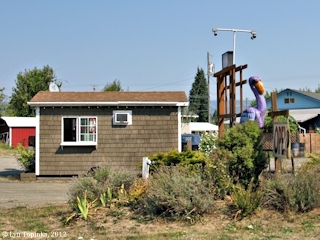 Click image to enlarge Oregon Highway 30, as seen from road from ferry, Westport, Oregon. Image taken May 20, 2015. 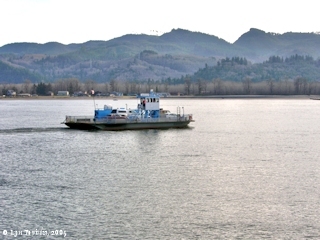 Click image to enlarge Puget Island Ferry "Wahkiakum" in route to Westport, Oregon. View from ferry terminal, Puget Island, Washington. Image taken March 5, 2005. 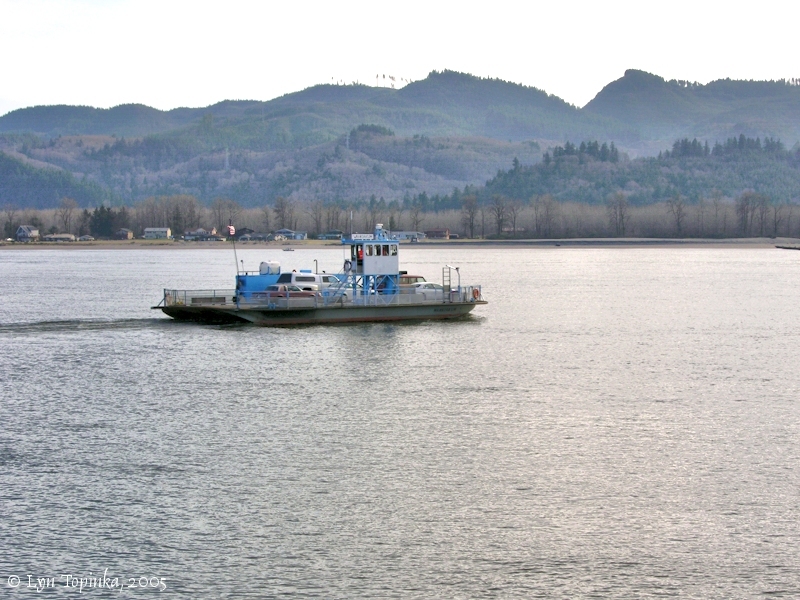 Click image to enlarge Puget Island Ferry "Wahkiakum" docking at Westport, Oregon. Image taken September 17, 2012. 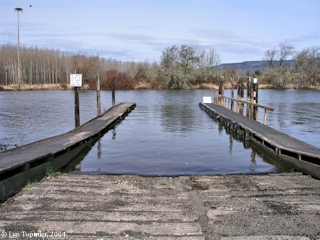 Click image to enlarge Westport Slough Boat Dock, Westport, Oregon. Image taken February 21, 2004.